Marlene Heideman decided to get in some exercise and sightseeing at the same on a cruise stop of the American Queen riverboat. Rolling a bicycle off the boat for a quick tour of Paducah, Kentucky, the Cincinnati woman says the pedaling transportation is a wonderful option. The neon green bicycles are a new perk aboard the American Queen. 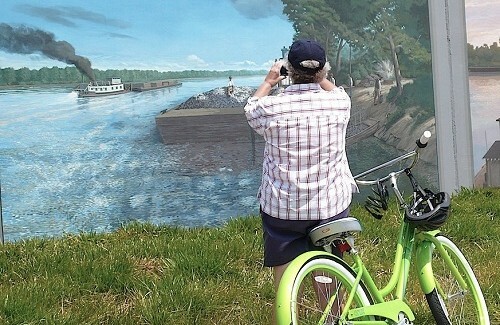 Passengers can use the bicycles and helmets free of charge to visit riverfront towns when the paddlewheeler docks. Marlene had cruised on all three boats – the American Queen, the Mississippi Queen and the Delta Queen – before they went out of business in 2008. When she heard that the American Queen was back on the rivers in April 2012, Marlene says she was thrilled and quickly booked a cruise.